There are so many wonderful things we do with our besties. From being support systems to cheerleaders, good friendships make us stronger partners and better people. Having a bestie to share your life with makes it brighter and more fulfilling. Knowing that a best friend will always be a part of your life is a gift. Sometimes, these friendships inspire us to do great things together. My best friends have inspired me to volunteer. Together we've done great things for the community, we've done charity work, and spent hours giving each other free therapy. But there's another side to friendship — a side that doesn't often get paraded around in the same way the good stuff does. You can't help it — within the first few minutes of seeing each other, you have to get a few minutes (hours) of gossip out of the way. It's been eating at you all day and you know it's safe to gossip with your bestie, even if it's wrong. You don't plan on actually committing a crime, but whenever you're alone with your bestie, somehow theft and murder always come up. You don't really mean it when you say you're going to steal your boss's husband or neighbor's horse, but like, you also don't not mean it. Whatever you swore you wouldn't tell, you tell your bestie. Someone could make it their dying wish for you to keep a secret, and you're still going to tell your bestie the second you're alone with her. It's not that you want to disrespect the wishes of others, it's just that you can't stand to know something and not share it with your bestie. Somehow, you always end up doing impressions of other people. It's awful, and it's probably considered bullying even if that person isn't there — and yet there you are, mocking a friend who's not there to defend themselves. You don't do it to be mean, but you can't help it. Together, you and your bestie plot the most insane schemes. You're going to seduce a pilot and trick him into kidnapping and flying your bestie's ex out to Bermuda to leave him there. Or you're going to sneak into the French embassy and steal a flag. These plans don't need to make sense. It's just mumbo-jumbo exercises in creativity and evilness. Besties send each other the ugliest pictures of themselves. The more ridiculous the angle, the better. The less lip, the more teeth, the bestest. We do it to make each other laugh. But if anyone ever found your phones, you'd be mortified. Besties don't have them. When they're home alone, they use the bathroom with the door open so they can continue to talk. It doesn't matter what kind of business is going on in the bathroom, an important conversation knows no bounds. Besties never stop texting. Sometimes they text each other while in a group to share secrets they don't want to say out loud. Other times they text each other from across the room because they're lazy. Besties can't get enough chat time in, no matter how much time they spend together. 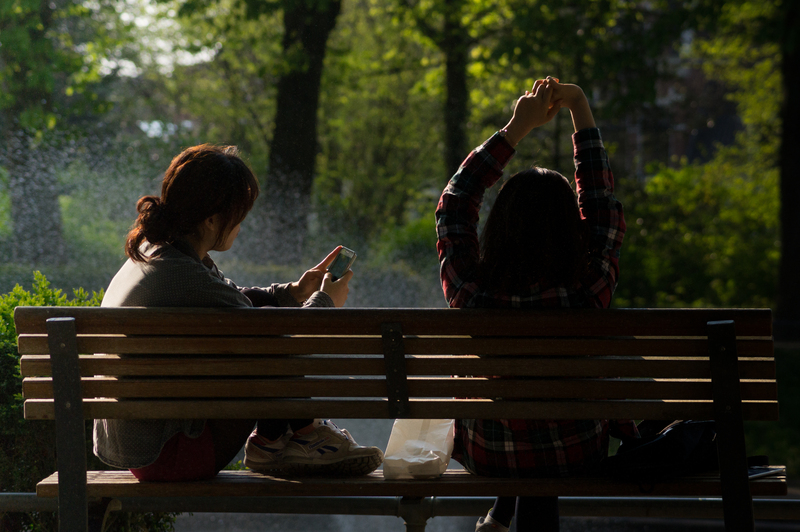 Besties turn internet stalking into a borderline criminal practice. They not only support it, but egg each other on and help with with investigations before dates and after break ups. Together they will spend hours combing the web for information for each other. For some reason, besties love to lie to strangers. Whether it's a guy who comes up to you two at a bar or a person asking for change on the street, the two of you lie for no reason. Maybe subconsciously lying together, like any of these other things, is a way for you to reinforce that it's the two of you against the world. No matter how inappropriate, immature, or outrageous your behavior is, it's to two of you, partners in friendship and pretend crime for life.